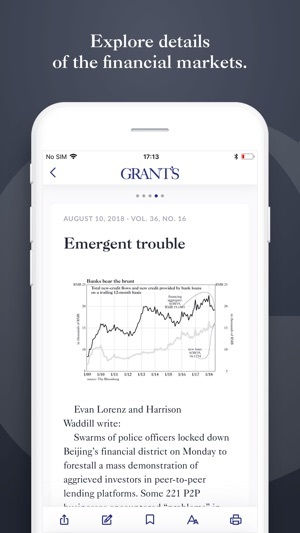 Now in its 35th year of publication, Grant's Interest Rate Observer is an independent, value-oriented and contrary-minded journal of the financial markets. We publish 24 times a year. Our mission is to identify investment opportunities in a range of markets at both extremes of valuation, high and low alike. A typical issue is likely to contain a long idea, a short idea, a macroeconomic comment and a monetary or credit analysis (and, of course, one of our famous cartoons). Without bragging, we like to think that we are the financial-information medium that least resembles CNBC. 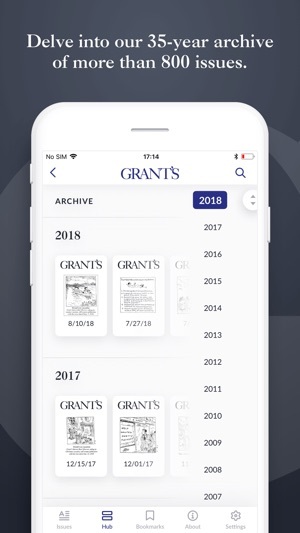 The Grant's app delivers each issue to you in a clean and easy-to-read format inspired by our print edition. 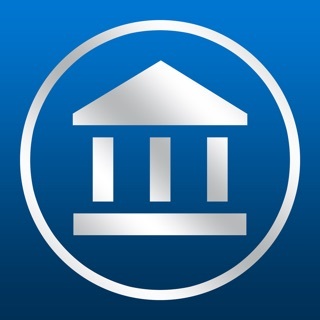 Within the app, you can download and read any issue, anytime or anywhere you have an internet connection. And when you are offline, you can read any issue you have already downloaded. It's easy to take notes as well as bookmark articles or share them with friends. 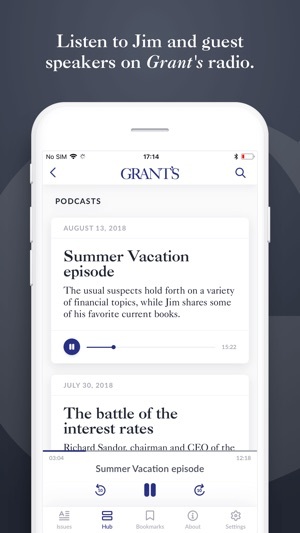 Beyond enjoying the stories in our flagship print edition, you can listen to our podcasts, stay up-to-date with our newsletter, "Almost Daily Grant's," search our 30-plus-year archive, and sign up for our conferences. 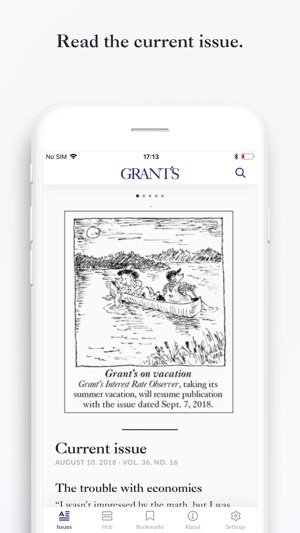 Grant’s and Grant’s Interest Rate Observer are Registered Trademarks of Grant’s Financial Publishing, Inc. Content is second to none but app interface is stale. Still not formatted for iPhone X and no ability to save content off-line. 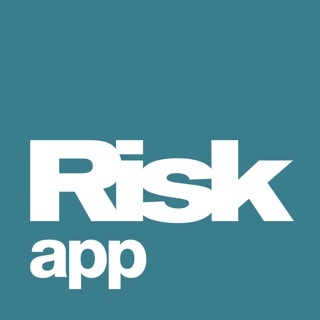 App is updated very infrequently. Great to have Apple and Grants for breakfast ! Finally! 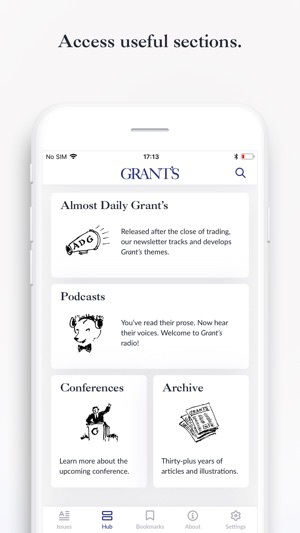 Thanks Grant's for working on some Apple apps... So great to take an issue for a walk, and access anywhere anytime... Great pub and great app. 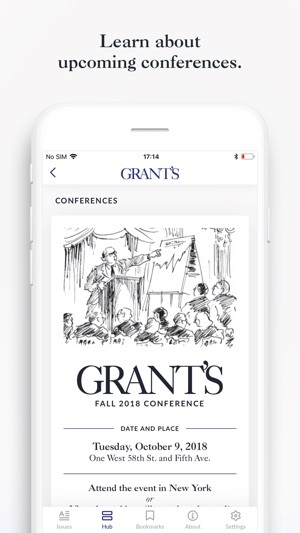 Do you know when Grant's next conference is? Don't worry, because this app will tell you on every five page turns.